Just the Facts and Speculation! First there is an unfortunate lack of documentation in this period when our ancestors first arrived in the New Colonies. Existing documents are sketchy and some that should exist, such as passenger lists, have yet to be uncovered, if they still exist at all. Second, there are numerous fathers and sons as well as mothers and daughters with the same first names leading to confusion about which generation is being referred to where actual documentation exists. For example; Capt. John named his eldest son John by his first wife; Mary (Cakebread) and his eldest daughter Sarah by his second wife; Sarah (Busby). Many sources appear to have these individuals mixed up. Finally, there were many premature deaths and remarriages at this time, many of which can only be inferred from other documents as no record is presumed to exist. Many authors over the years have printed inaccurate information and the Internet has only exacerbated the problem. Much of the posted information can be debunked by close examination of the few known documents or by constructing a time line, i.e. following peer age cohorts. Unfortunately much of the conjectural information cannot be disproved or proved. Below I`ve gathered just the facts we know to be true, whether by documentation or clear inference. As you digest these facts remember that many of the named people may not be the same individuals and I have made no attempt to indicate them by generation as the existing documents do not. NEW! I have written a Proof Argument detailing how Morse got the marriage of Capt. John and Sarah Busby wrong which has muddled this era of Grout history since 1857. 1619, 12 Dec. Sarah Busby, daughter of Nicholas Busby, is Christened [From St Mary Coslany records] ed. note: Christening dates are not necessarily birth dates by Puritan custom. She could have been as old as 8. 1636 to 1640 John Grout acquires lots in Watertown from Thomas Cakebread and settles there [From Watertown town records] ed. note: on the map both names appear on the same lots. 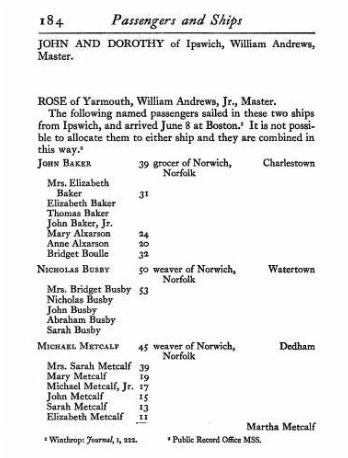 1637 Sarah Busby sails to Boston aboard the Rose with her family. 1642/43, 4 Jan. Thomas Cakebread dies [From Sudbury town records] ed. note: the date 1642/43 reflects the change from the Julian to the Gregorian calendar which took place in 1582 in Europe but not in the New Colonies until 1752. 1643, 23 Oct, Sudbury record states ``Lande formerly granted to Thomas Cakebread is now in the possession of Sara Cakebread Widdow`` [From Sudbury town records] ed. note: Note that Sara is referred to as `widdow` here and again as late as 14 Dec 1646 well after the date John and Sarah (Busby) married. 1649, 24 Jul, ``Joseph, son of John & Sarah GROUT`` [From Sudbury birth records] ed. note: All birth records of the subsequent 5 children of John and Sarah Grout can also he found here. 1652, 14 Jan, Sudbury town ordinance states, ``Granted to John Grout 6 acres... formerly granted to his Father Cakebread`` [From Sudbury town records] ed. note: There are several other records that call Thomas Cakebread John`s ``Father``. 1670, 22 Mar, In a legal dispute John Grout`s representative describes a property as ``formerly belonging to his father-in-law Tho. Cakebread`` [From Morse pg. 9] ed.note: Morse reports this was possibly Capt. John`s son, John2, but leaves it an open question. Please check back here as I will add new facts as they emerge. NEW! 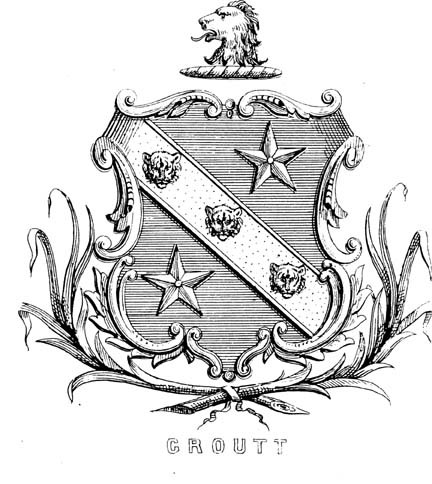 You could answer one of the many questions about Grout ancestry. Find out how here. Capt. John Grout and the Cakebread family were very intertwined in the early 1600`s. John was very close to Thomas Cakebread in Watertown and married to a Mary Cakebread. After she died a few years later Morse reports he married to the widow of Thomas Cakebread, Sarah Busby. But this has been disproved by the fact Thomas arrived with a wife ``Sarah`` with the Winthrop Fleet in 1630 and Sarah Busby arrived with her family aboard the Rose in 1637. However, the incorrect facts continue to be perpetuated on the internet. In fact there are two competing theories regarding the relationships between the Grout`s and Cakebread`s in the early 1600`s. In the first theory, put forward by Morse, John Grout first marries Mary ---, and Thomas Cakebread is married to Sarah Busby. By 1643 Mary dies and Thomas also dies then John marries Thomas`s widow Sarah (Busby) Cakebread. Conventional wisdom has been that Sarah Busby was first married to Thomas Cakebread because John Grout took possession of his Mill in Sudbury by 1643. It is also thought she brought a daughter to the marriage named Sarah Cakebread who later briefly marries John`s son. However there are big holes in this theory. In Sudbury town records Thomas is referred to as John`s ``father`` and a Sarah Cakebread is referred to as ``widdow`` beyond the date John and Sarah Busby had children together. What seems clear is that Morse did not know Mary --- was Mary Cakebread, as proved by the Cutler family history, or that Mrs. Sarah Cakebread and Sarah Busby arrived in Boston aboard separate ships 7 years apart. In a more recent theory Mary --- is correctly identified as Mary Cakebread, the daughter of Thomas who is said to be married to Sarah Busby. This theory would have us believe John second married his former mother-in-law! We know certain that John Grout and Sarah Busby married and 2 different Sarah`s came to Boston 7 years apart so this theory cant be correct. This is what I believe to be the facts as born out by the documents we have: The Sudbury Miller Thomas Cakebread was of an older generation than Capt. John and took in young John and his brother when their father died around 1634. Thomas was married to a Sarah ---, (but not Sarah Busby). Capt. John first married Mary Cakebread who was the daughter of Thomas thus making Thomas both John`s adoptive father and father-in-law. They have one child in Watertown: John2 in 1641. After Mary`s death John remarries to Sarah Busby in 1642. When Thomas Cakebread dies in 1643 he leaves his Mill to John. John and Sarah live out long and eventful lives and have many children together. Also, John2 never married his step sister as Morse claimed. It was in fact Capt. John who brought the legal claim and accurately calls Tho. Cakebread his former father-in-law. Finally, the widow of Thomas Cakebread, Sarah--- is the one who marries Philemon Whale 7 Nov, 1649. I acknowledge this theory has thin documentation but I see no other alternative. The facts that I know of support this theory however I eagerly look forward to the uncovering of new facts and maybe a timeline of events will emerge we can all agree on. This web site is provided free, however, there are costs I incur. If you found this web site helpful, consider making a small donation.